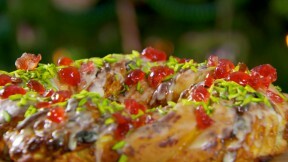 This mincemeat and marzipan couronne recipe by Paul Hollywood is featured in the Season 1 Masterclass: Christmas episode. Tip the flour into a large mixing bowl and add the salt to one side of the bowl and the yeast to the other. Add the butter, milk and egg and turn the mixture round with your fingers. Continue to mix until you’ve picked up all the flour from the sides of the bowl. Use the mixture to clean the inside of the bowl and keep going until you have a soft dough. When your dough feels smooth and silky, put it into a bowl, cover with cling film and leave to rise for 30 minutes to 1 hour. Line a baking tray with baking parchment or silicone paper. For the marzipan, put the caster sugar, icing sugar and ground almonds into a large bowl and mix well together. Stir in the orange zest and beaten egg until evenly combined and the mixture begins to form a paste. Turn the risen dough onto a lightly floured surface. Without knocking it back, roll out the dough into a rectangle, about 33 x 25cm. Turn the dough 90 degrees if necessary, so you have a long edge facing you. Spread the mincemeat evenly over the dough. On a lightly floured surface, roll out the marzipan thinly and lay it over the mincemeat. Roll up the dough tightly like a Swiss roll. Roll it slightly to seal, then cut it almost in half lengthways, leaving it just joined at one end – like a pair of legs. Twist the 2 dough lengths together, then join the ends to for a circular ‘crown’. Transfer to the baking tray. Leave to prove for 30 minutes to 1 hour - until the dough springs back quickly if you prod it lightly with your finger. Meanwhile, heat your oven to 400F. Bake the couronne for 25 minutes until risen and golden. Place on a wire rack. Gently heat the apricot jam with a splash of water, sieve and brush over the warm loaf to glaze. Leave to cool. Mix the icing sugar with enough water to make a thin icing, brush over the loaf and sprinkle with the pistachios and cherries.